If you looked for a sale on the highly popular, glowingly-reviewed Bose QuietComfort 35 headphones on Amazon Prime Day last week, you were disappointed. Prices held firm at $350. Highly prized, newer electronics don't get much love from Amazon on Prime Day. The Bose QuietComfort 35 wireless, noise-cancelling headphones rarely see sales unless authorized by Bose, which probably insists on a Minimum Advertised Price in national advertising from retailers. The only exception I saw was when Walmart.com had them for $341.98 on July 13 but a week later they no longer appeared on the site. Leave it to Bose to beat Amazon Prime Day with the best deal on the 35s since they were introduced last year. The QuietComfort 35 is now available for $260, a savings of $90. A few weeks earlier the reconditioned headphones were on sale for $280. When not on sale, the refurbs are $315. Is there a catch? Yes and no. The $260 price is only for factory renewed units in Bose outlet stores through August 22 while supplies lasts. No rain checks. in Minnesota, you can get them at the sale price in the Albertville Premium Outlets store (763-497-6990) but not the full-priced Mall of America showroom (952-854-6978). If you buy one reconditioned Bose item, you can get 25% off another factory-renewed item, including headphones, at most of the outlets nationwide. All Bose refurbs can be returned for a full refund within 30 days. The 30-day return policy on virtually any item explains why the company might have so many refurbs to sell. An employee in Albertville said many items are returned within 30 days for reasons such as color swaps or gift exchanges. Returns are then certified by Bose lab techs to be in perfect condition before resale, although they have to be labeled as factory renewed. CNET rated the QC 35 an 8.8 out of 10, describing it as "Bluetooth meets best-in-class noise canceling: It is the ultimate noise canceling wireless headphone you can buy right now." 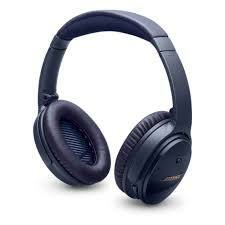 It was downgraded for its high price, a non-replaceable battery, and a slightly heavier weight than the Bose QC 25. Consumer Reports gave the QC35 its highest headphone rating (87 out of 100). It bested the Audio Technica SonicPro ATH-MSR7NC ($300), which received a CR score of 81, Sound Advice columnist Don Lindich, whose column appears in the Star Tribune, prefers the Audio Technica's sound but Bose's noise canceling. On Thursday, July 20 Albertville received about 40 of the headphones in black and about the same number in silver. If they sell out, the store may still receive more during the sale. Or not. Most Bose outlets, including Albertville, do not allow holds or pre-payments. The purchase must usually be made in person. Here's the map to check other outlets around the country. If the main Bose factory (1-800-379-2073) has the refurbs in stock, you can order one but as of July 13, they were out of stock. In case the accolades of the Bose QC35 seems too good to be true, here's a voice of dissent. If you like "loud, bass-heavy music" test the headphones in the store for pops and clicks or keep your receipt handy for 30 days and return them for a full refund. Finally, if you think it's crazy to spend $260 for a pair of headphones, no matter how good the reviews, CNET has chosen the best cheap headphones (mostly earbuds) for 2017 for $15 to $40. But if you're still waffling over paying $260, check out more than 1,000 Q & As on Amazon regarding the QC35. For example, "does Bose does include a cord with the headphones to use on airplanes?" Yes.